The GCA is 50 years old and we think that’s a milestone worth celebrating. 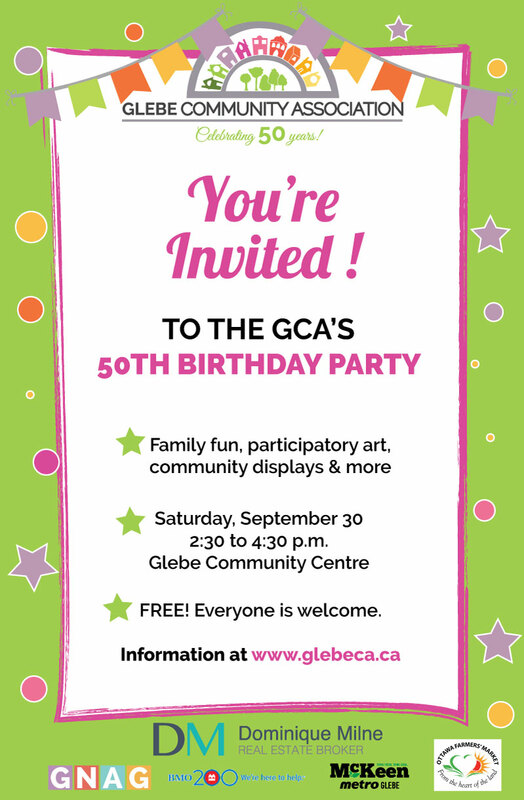 Whether you’re a long-time Glebite or new to the neighbourhood, join us for this community party for all ages. * Help create a new work of art for the Community Centre. * Enjoy hands-on kids activities with face painting and tattoos. This event is free! Everyone is welcome to drop in and meet your neighbours. Thank you to, Dominique Mine Homes, BMO Glebe, Ottawa Farmers Market, McKeen Metro Glebe, Bloomfields and our good friends at GNAG.